Cantù, in the province of Como, has long been known as a prestigious production zone of wooden furniture and is home to Molteni Tavoli Nautici, a company that designs and produces refined objects for the sailing sector. The Molteni collection offers a choice of tables with a refined design, leaving great space for personalisation. 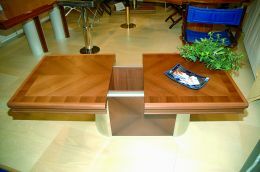 Molteni's products in the sector of tables, not only for boats, is divided into three lines: "I Mari", 'I Venti' and 'Domus'. The 'I Mari' collection comprises boat tables characterised by the use of carefully worked choice materials, enriched with precious inlay detail and solid wood edging. We are talking here of tables that last, thanks to research into materials and varnishes, tables with top onboard qualities, resistance to wear and tear, time and salt. 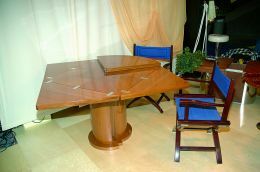 These are tables with tops supplied in natural finishes (opaque or polished) or lacquered (opaque or polished), mounted both on telescopic or wooden bases. Good looks aside, the practicality and functionality of 'I Mari' are immediately obvious. The 'I Venti' collection is made up of multi-functional tables, suitable both for boats and for the home, in different shapes and sizes. These are particularly elegant and refined pieces, carefully made. The tops can be naturally finished or lacquered; both versions can be opaque or polished and they are mounted on telescopic bases in light alloy, aluminium, gilded brass or wooden pedestals. 'Domus', as the name suggests, is a series entirely dedicated to tables for the home. In terms of market coverage, the Molteni Table catalogue is present in America, especially in Florida, while most of their export goes to Germany, Switzerland and France. Abroad, as in Italy, the characteristic opening up of the company towards personalisation of the inlay details is much appreciated, as is the use of different materials, typical note of attentive production on a craftsmanship level. Avant-garde tables also thanks to their tops, which can be made using carbon to guarantee minimum weight and the typical resistance of this material. Let us not forget also that the steel bases all have hidden screws, increasing levels of safety. Furthermore, the bases are equipped with gas pistons, for easy height adjustment. Molteni also produces directors' chairs and stools for boats, in solid wood with canvas seating resistant to the elements or in leather. What transpires from the whole Molteni production is the excellent craftsmanship quality, which in no way deflects from the modern design; the study and effects of the inlay, the movements of the mechanisms, the use of materials, including very original ideas, care paid to harmonious chromatic choices.